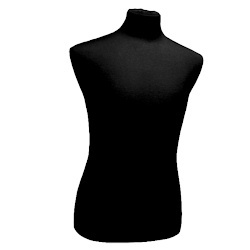 This size 38 upper torso display form is great for a different array of coats, shirts and suits. 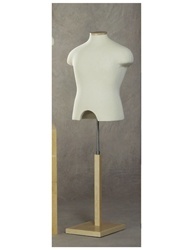 Torso will stand up by itself on nesting table or shelf or add a base. Brushed steel neck cap included. Add a Hanging loop base or center base for additional cost - chose in options. Hanging loop base shown in picture with torso. Contact us and we can design your own unique covering with a wide selection of neck caps and bases.